Our Clear Poly Bags are made from a 2ml polyethylene plastic. They are clear but not as clear as our Premium Crystal Cello Bags. They zip close. Not recommended for items being displayed in a retail setting as they have more of an industrial appearance. They meet the FDA requirement for direct/indirect food contact. Economical alternative to other bags. Dimensions: 5 x 7 inches. "Good for small favors "
COMMENTS: These are perfect for my smaller items. You can smell the scents through the bag. "So glad I found these bags!!! " COMMENTS: These were precisely what I needed to package my larger CP bars. I like to use the zip close bags, as they allow easy access for customers to open & smell the soaps without damaging the packaging. The only problem was that the largest zip-close bags I could find at local craft shops were 4×6 and I struggled getting some of my bigger bars in these baggies. With these 5×7 bags, it's easy-peasy! After packaging up the soaps, I stick a label on, use a hole puncher to create a hole I can string a ribbon through, tie a bow and I'm good to go! Looks professional & pretty, and it's convenient for everyone! Customers can open & close the bags to get a good smell of each product, and packaging up large quantities at a time doesn't take me long at all, so it saves me a ton of time too! Very happy I found these baggies & will continue to purchase! Thank you WSP! • Excellent quality & price! Very durable. • Saves me a lot of time with packaging. • Smelling product is easy for customers. "Serves it purpose and more!" 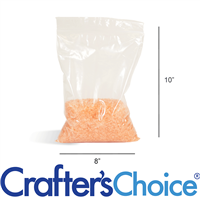 COMMENTS: I use these bags to store sample sizes (1 oz) of my full size wax melts! They hold the scent and you can store multiples together without the scents bleeding. No labels needed either, just label with a permanent marker. "Clear Poly - Zip Close Bags 5 x 7 "
COMMENTS: I save a ton on these for bagging my bath bombs. COMMENTS: These are perfect for my bath bombs. Simply label the bag and drop the bomb in. "Clear Poly - Zip Close Bags 5 x 7"
"Not as clear as I liked"
COMMENTS: Not as clear as I expected. Picture looks pretty clear but really it's a zips lock bag. But it works. Just not what I expected. Just won't order more used them this time . COMMENTS: Perfect for bagging M&P for customers at the market table. Add a label to customize for your business. COMMENTS: These bags are the perfect size to bag up my samples to send home with people.I actually use them for a variety of things, they really come in handy. COMMENTS: great for storage of raw products in the work room. so worth it, glad i bought them. COMMENTS: Excellent value, perfect to ship sprayer & pump tops! COMMENTS: What I expected. Quality is good and I use for my natural health store. COMMENTS: love how fast and easy these are, and you can seal them shut for safe shipping and handling at craft shows, Your fragrance stays sealed in. • would not change a thing . COMMENTS: I use these for small soaps and other items. Drop your item in, seal, staple a folded card tag over the top edge. So easy! COMMENTS: These bags were perfect for my samples and business cards. The are thick enough not to rip, the seal up tightly and are see throw. Very Sturdy versatile bags. "Great to have on hand." COMMENTS: I originally got these to hold my bath salts.. (I know they're a little industrial looking.. but my customers don't mind it if it means cheaper!) but I've been using them for everything! Hold color sets together, keep lip balm colors separate, keep bath fizzies away from moisture in the air.. you name it! COMMENTS: I use these for selling my M&P soaps. They don't come with a closure or tie, so you either buy those separate or use tape. When using tape it it still allows moisture in and the soap can sweat. I wrapped mine in plastic to keep from sweating, but then you have everyone trying to smell them and can't. COMMENTS: I purchase this bags to use with my lotion bars. Great size will order more. COMMENTS: Really like this bag but wish there was a 5x5 size. They are nice seal bags. Would work well for a lot if different things. COMMENTS: These come in very handy for when my clients are purchasing a couple of items. Everything fits very nicely in them and with the zip closure I don't have to worry about anything falling out. COMMENTS: I use these for storage bags for my small items to take to shows and fairs. COMMENTS: I use these bags for my homemade bath fizzies. These are pretty heavy duty and they seal well so they are perfect! COMMENTS: Great for packaging lotion bars, bath fizzes and bath teas (bags). COMMENTS: These are excellent for packaging sachet beads. Great price! "Would this bag be better suited for 8oz or 16oz of Bath Salts?" I can't quite fit 2 cups of bath salts in this size. "Can you store bath salts with essential oils in these bags and are they air tight? " Yes, these jould be fine for storing scented bath salts. "Are these bags approved for food contact? " Staff Answer Good question! Yes, per our overview, these bags 'meet the FDA requirement for direct/indirect food contact'.